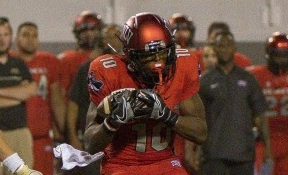 UNLV coach Tony Sanchez was willing to put his wide receiver corps, led by preseason first team all-Mountain West pick Devonte Boyd and 6-foot-4 junior Kendal Keys, up against any team in the league heading into the season. Not to mention a whole lot of injuries. Redshirt freshman Darren Woods Jr., an emerging star who is second on the team in receptions behind Boyd with 13, injured his left knee in last Saturday night’s 45-20 homecoming win over Fresno State and will need to undergo season-ending surgery. He joins Keys (knee) and sophomore Brandon Presley (foot) on the sidelines. That means the Rebels (2-3, 1-0 MW) will be without three of their top four receivers heading into Saturday night’s game at preseason West Division favorite San Diego State (3-1, 0-0). Sanchez said the Rebels will likely use tight ends Andrew Price and Tim Holt, who is also questionable after taking a shot to his leg against the Bulldogs, in the slot in some formations to help compensate for the loss of Woods. True freshmen Mekhi Stevenson and Elijah Trosclair, who caught a 61-yard touchdown pass against Fresno State, as well as tiny 5-foot-5 (if that) redshirt freshman Allan Cui III, a fan favorite during fall camp, also will see increased roles. San Diego State is a 14-point favorite against the Rebels who haven’t won at Qualcomm Stadium since 2000.